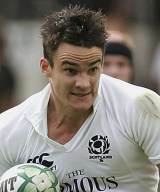 Max Evans followed his brother Thom on to the international stage when he made his debut for Scotland against Canada at Pittodrie in November 2008. In doing so, they became the 45th set of brothers to play rugby for Scotland, though Thom missed that match because of injury. A Six Nations debut followed against Wales three months later and he celebrated his appearance off the bench with a try. He was subsequently handed his first start against France in Paris the following week. Thom returned to the XV for that match, and they thus became the 20th set of brothers to play together for Scotland. Max played in all five matches of the Championship, starting in four. He remained a key figure in the squad throughout 2010, scoring against Wales during an epic Six Nations encounter, with his time split between wing and centre. But he saw his brother's career ended by a horrific neck injury suffered during the Millennium Stadium clash. Having already represented Scotland 'A', scoring tries in big wins against Georgia and Ireland 'A' , before making up for his lack of game-time on the 2008 tour to Argentina by taking to the field against the Canucks. Evans also featured during the 2011 Six Nations but his season was blighted by injury while surgery on his elbow sidelining him for the season run-in. Evans joined Magners League side Glasgow Warriors from Glasgow Hawks in 2007 having previously spent time at London Scottish and Harlequins. His opportunities with the Premiership side were limited by a back injury, so between 2004 and 2006 Evans moved to Portugal and became a professional golfer whilst completing physiotherapy to allow him to return to rugby. In 2011, Evans agreed a move to French Top 14 side Castres and is set to join his new club following the Rugby World Cup.